The sun is a dynamic star, made of super-hot ionized gas called plasma. The sun's surface and atmosphere change continually, driven by the magnetic forces generated by this constantly-moving plasma. The sun releases energy in two ways: the usual flow of light that illuminates the Earth and makes life possible; but also in more violent and dramatic ways--it gives off bursts of light, particles, and magnetic fields that can have ripple effects all the way out to the solar system's magnetic edge. We study the sun to better understand how its ever-changing conditions can influence Earth, other worlds, and even space itself. NASA studies the sun for numerous reasons. For one thing, its influence on the habitability of Earth is incredibly complex, providing radiation that depending on the amount can be either a boon or hazard to the development of life. Second, this radiation, and the accompanying energy and magnetic fields that the sun sends out -- is intense and dynamic, with the ability to create changes in the space weather [link to space weather 2d] around us, and interfere with our space technology and communications systems. Finally, we study this star we live with, because it's the only star we can study up close. Studying our sun informs research about other stars throughout the universe. The sun's activity and conditions vary on almost every timescale, from tiny changes that happen over milliseconds, to solar eruptions that last hours or days, to its 27-day rotation. The solar magnetic field cycles through a complete change in direction and back about every 22 years, which in turn gives rise to the roughly 11-year cycle in solar activity. As magnetic field becomes more complex, it releases energy near the solar surface. These solar explosions can take the form of solar flares, coronal mass ejections, or releases of incredibly fast charged particles that race out from the sun at nearly the speed of light. NASA watches the sun nearly 24-seven with a fleet of solar observatories, studying everything from the sun's tenuous outer atmosphere, to its roiling surface, and even peering inside the sun using magnetic and helioseismic instruments. NASA observes the sun and studies its processes with such missions as the Solar Dynamics Observatory, the Solar Terrestrial Relations Observatory, the Interface Region Imaging Spectrograph, the Reuven Ramaty High Energy Solar Spectroscope Imager, the joint ESA/NASA Solar and Heliospheric Observatory, and the joint JAXA/NASA Hinode. In 2018, NASA plans to launch two more sun observers: Solar Probe Plus and the European Space Agency/NASA's Solar Orbiter. Solar activity follows a roughly 11-year cycle. 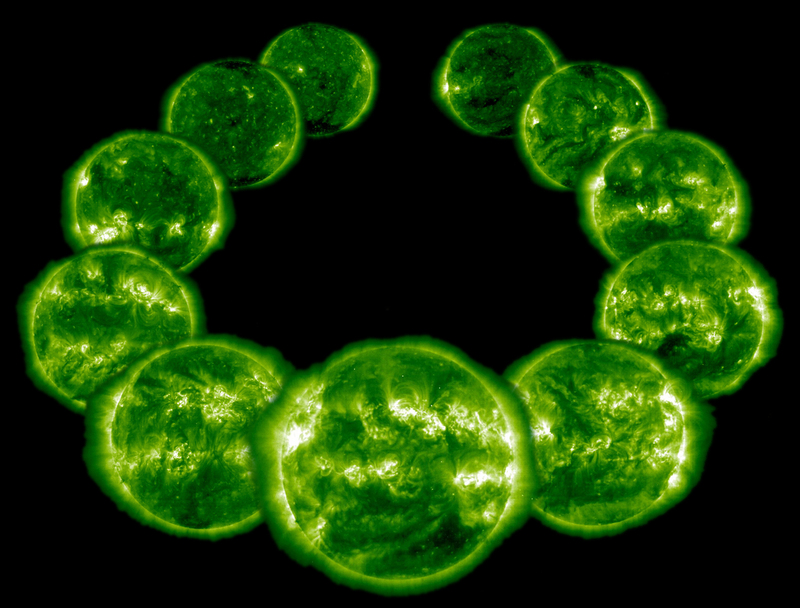 This composite image shows the sun in extreme ultraviolet wavelengths about once a year over the course of a complete solar cycle. This type of light is typically invisible to our eyes, but is colorized here in green. As the solar cycle slopes towards solar minimum, the bright active regions, often accompanied by dark sunspots on the visible-light sun, become fewer and smaller. Active regions are the source of most of the sun's outbursts, meaning that solar activity and number of active regions decline together. As the activity cycle picks back up, these bright active regions cover more and more of the sun's face, while solar activity becomes more and more frequent.